“Super Blog Team-Up” is back, and this time, an expanded roster of some of the finest comic book blogs on the internet is tackling a controversial topic in the medium we profess to love: retroactive continuity, or retcons for short. Over the years, these little “alterations” of a certain character’s history have been applied with mixed results. For my entry, I’m taking a look at the two-part “Mind on Fire” storyline in Amazing Spider-Man #581-582, which discusses how Harry Osborn returned to the land of the living. Retcons can often be a dirty word when applied to the Spider-Man universe (hello “One More Day” and your red-headed stepchild, “One Moment in Time”). But there are a number of instances where a continuity change was needed and ended up making an either forgotten or reviled Spider-Man story better (hello Hobgoblin Lives). Then there’s “Mind on Fire” in Amazing Spider-Man #581-582, a unique instance of a retcon sounding like a terrible idea on paper (Harry Osborn back from the dead? ), but actually being well executed because the story is filled with sound logic and is true to the characters involved. When the “Brand New Day” era of Spider-Man was ushered in with the grace and dexterity of a three-legged bull ice skating on a 40 degree day, fans were so outraged by how Peter Parker’s “deal with the devil” dissolved his marriage to Mary Jane, that a number of other editorial changes that significantly impacted the Spidey universe were seemingly lost in the shuffle. 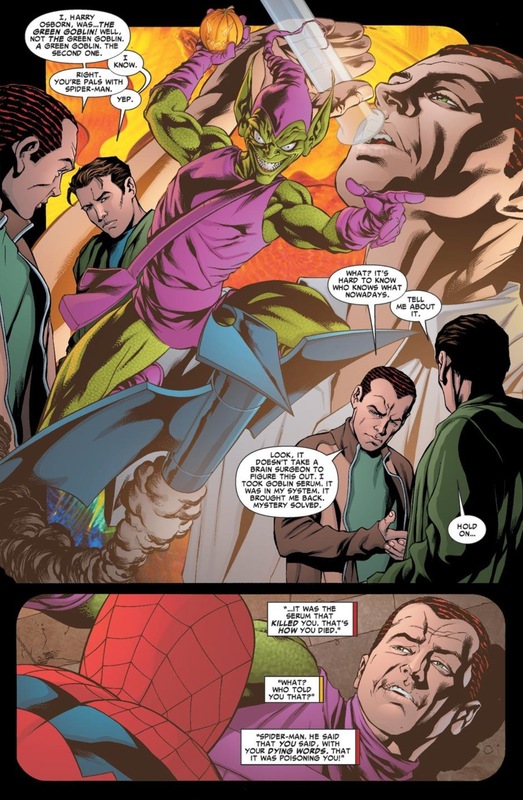 One of which was the fact that Harry Osborn, long-presumed dead since the epic Spectacular Spider-Man #200 (arguably one of my favorite single-issues of Spider-Man of all-time) was suddenly alive and well again, managing a Coffee Bean, and resuming his trademark tense and awkward relationship with his father, Norman. Characters being resurrected is second nature for the comic book world, but part of what made Harry’s revival eyebrow raising was just how perfectly executed his death was in Spectacular #200. The issue marked the culmination of a long-running storyline by J.M. DeMatteis and Sal Buscema that focused on Harry’s decent into madness and return to the Green Goblin persona. The wonderful “Child Within” storyline looked into the childhood trauma that started Harry down his dark path, and the stakes were raised further by the intensely uncomfortable Spectacular #189. 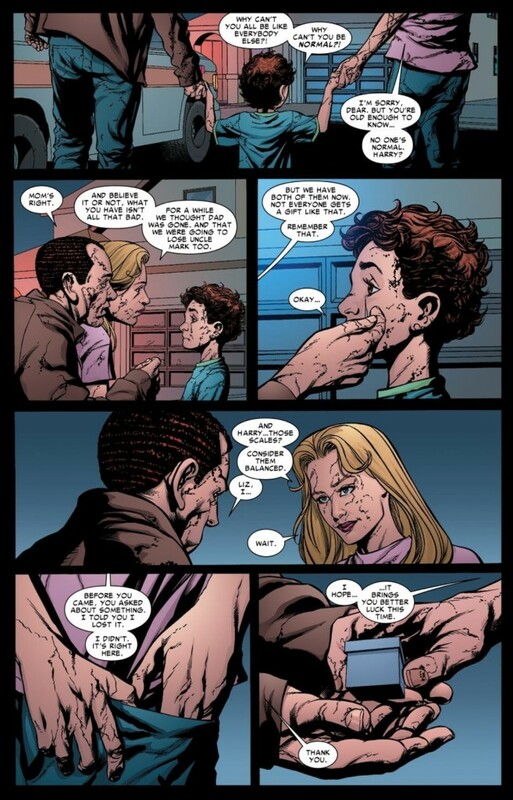 By that point, Harry’s sanity was so far gone, and his hatred for Peter/Spider-Man was so intense, that it was patently obvious that Osborn would either succeed in killing his friend, or he himself be killed off. Spectacular #200 gives us that inevitable ending, but also redeems Harry by having him rescue Spider-Man and his wife and child (Liz Allen and Normie) from an exploding building before dying from an adverse reaction to the dreaded Goblin formula. It’s a story DeMatteis remains fiercely proud of to this day, and rightly so. Endings so perfect rarely come along in this medium, so it was unclear why Marvel chose to bring Harry back from the dead other than “because.” It was equally troubling when nobody actually explained where Harry had been this whole time, but Dan Slott and Mike McKone take on this task in ASM #581-582 when they send Peter and Harry out on a road trip to take care of some “business” involving his ex-wife Liz, Normie, and Harry’s brother-in-law, the supervillain, Molten Man. 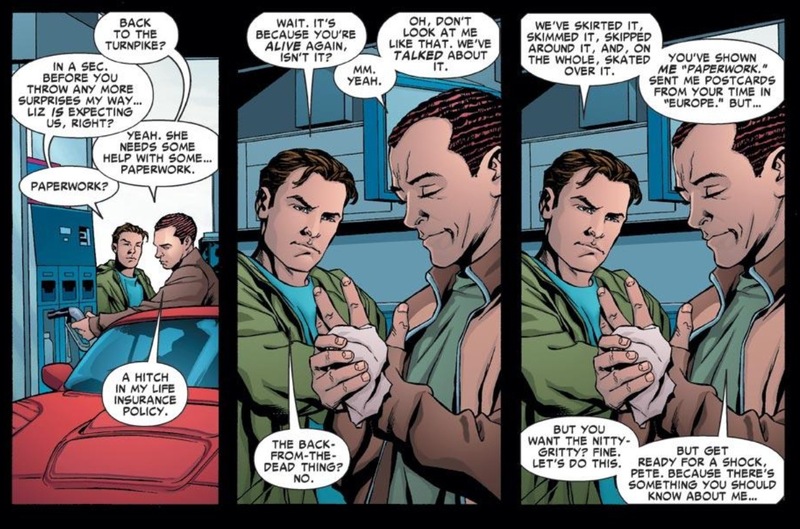 It’s during this road trip that Peter asks Harry what all ASM readers were thinking: so umm… what’s with the being dead and alive thing (I’m paraphrasing here)? Harry casually responds that he thought he already explained all that, but before every last post-One More Day Spider-Man fan could riot by this lack of clarity, Harry offers a pretty detailed and straightforward account of what’s been going on the past few years. 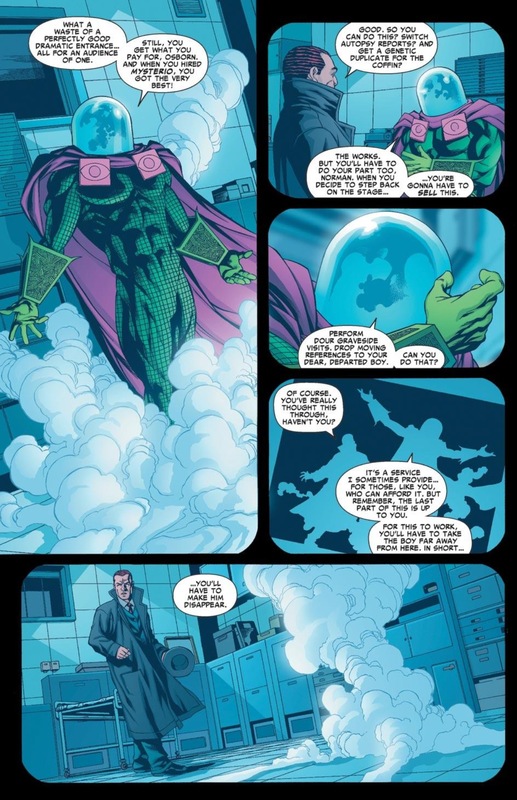 In short, the Goblin Serum that presumably killed him, kept him alive and while he was being taken to the morgue, good ol’ Norman shows up, pays off some people so he can get possession of Harry’s body, and then employs the master of special effects Mysterio to find a substitute body for funerals, the casket, etc. Norman proceeds to send Harry to Europe where he’s instructed to “lay low” and clean up his act for a few years, before allowing him back into the U.S. and living in Peter/Spider-Man’s world again. It’s not the most groundbreaking explanation, but what it lacks in elegance, it makes up for it sound logic and reasoning. Namely, Marvel did a similar resurrection angle with Norman a few years earlier after he was presumed dead at the end of ASM #122. While Norman’s return was even more shocking at the time – especially when it was revealed that he was the mastermind of the “Clone Saga” and later that he had hired a body double for Aunt May and faked her death in ASM #400 (speaking of terrible retcons) – by the time ASM was in “Brand New Day” mode, I don’t think anyone was too upset about Norman’s presence in our comics. Having Norman hide Harry in Europe all those years was lockstep in how the Osborn-family patriarch had been characterized (as a Lex Luthor-esque master manipulator and power broker) and bringing in Mysterio and his unique (and underrated) skillset was icing on the cake. So, thus far, no arguments from me. Adding to the quality of this story is the fact that Slott goes a long way demonstrating just how much Harry had matured and grown up. Harry still has an understandably tense relationship with Liz and Normie due to that whole faking his death thingee, but he also goes out of his way to prove to them that he has their best interests in mind, which is consistent with how the character was redeemed in Spectacular #200. We discover that Harry goes to Liz and Normie so he can administer a cure he concocted for Mark Raxton, aka, the Molten Man. 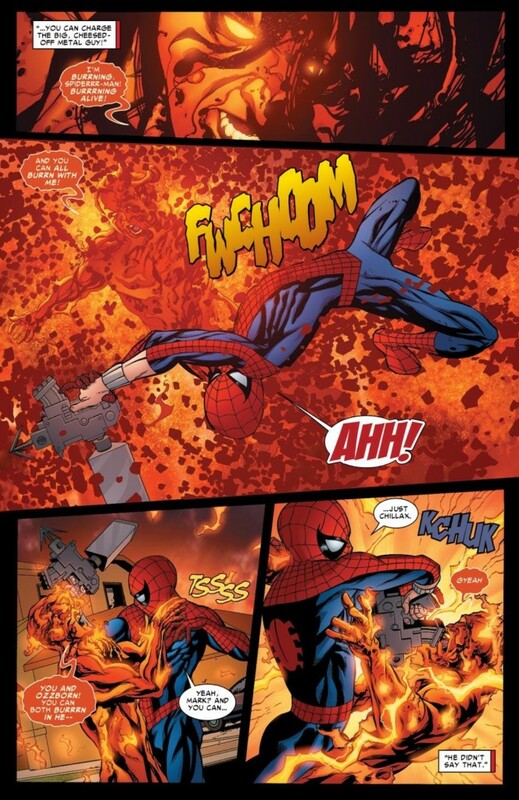 Things got out of hand when Raxton sees Harry, but after Spider-Man shows he’s not afraid to fight the good fight in New Jersey, the Molten Man gets his cure. If Marvel had just brought Harry back to become the Green Goblin once again, ignoring all of JMD’s careful detail and characterization, it would have been a slap to the face to one of the great stories of the modern era. Instead, ASM #581-582 reads like it evolved organically from those older stories. Silver Age Sensations: The Red, White and Blue Avenger! 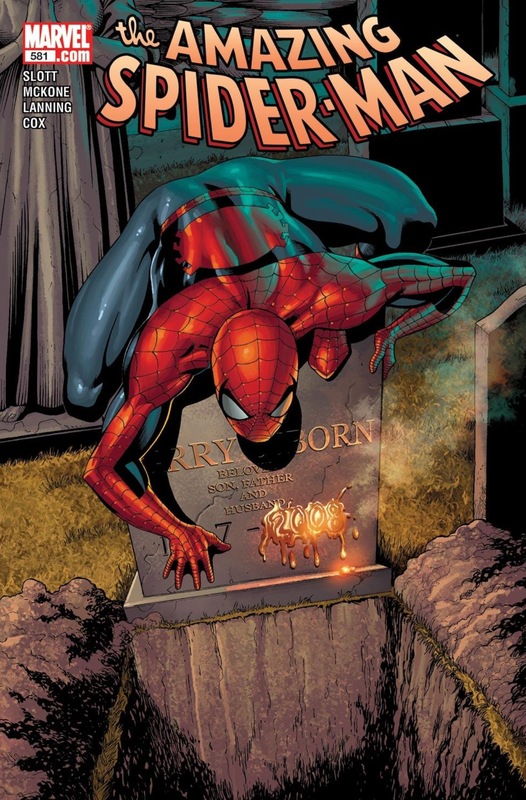 Superior Spider-Talk: Peter Parker – Child of Radioactivity or Mysticism? I think the *why* of Harry’s return is pretty clear. Since BND was about softly rebooting Spider-Man to get rid of his marriage and make him feel younger again, the return of his best pal from his hey-day makes perfect sense, esp. when it lines up with what was depicted in the movies. While the movies and the comics don’t ever line up perfectly, I think there is an idea that if a movie-goer does deign to pick up a comic at the very least they should find the same characters around to have something to grasp on to in the transition. And as you mention, Norman’s return already laid the groundwork for the possibility of Harry’s return, so it works – even if Norman’s return is even more of a travesty from my perspective. Norman’s return is one of those things I got back and forth on. I hate it on paper, but the character has been used REALLY well in certain storylines over the years (moreso in Ellis’s Thunderbolts run and a lot of Paul Jenkins Spidey stuff) that I don’t mind it as much as I used to. And he got a little too close to Lex Luthor territory, being used as a world-threatening villain against the Avengers and so on. I didn’t read this run but it sounds like the right kind of ret-con. Leaning that Harry’s old man flexed his muscles to get his kid out of sight for a couple years, hoping that he’d learn something about himself and maybe enjoy a new start … that rings true as something a well-monied and crazy (but ultimately well-meaning) father might do. Having Harry come back to put the pieces of his life back together is also a nice twist, and altogether superior to the “shocking return” of villain being tossed off in a couple expository panels, as was so often the case in my beloved Bronze Age. Great post, friend! I am totally in the dark as far as reading current comics, Spidey included. But I really appreciated the depth you gave today’s topic, as I feel I’ve been somewhat brought up to speed on some of the goings-on. Spectacular Spider-Man #200 was indeed a great story, and back in those days Marc DeMatteis was a fine curator of Spidey and his cast, wasn’t he? Harry’s return seemed less earthshaking than Norman’s, but was handled more effectively. Give a lot of credit to Dan Slott; he has been responsible for some pretty solid writing in Spider-Man’s world the past few years. Peter and Harry’s relationship has been quite the rollercoaster ; the story referenced above nicely illustrated the maturing of that relationship. As an older reader I sometimes find ‘comic book deaths’ frustrating because they can fell like a slap in the face of the poignant stories that have already been told. I have to remind myself that some refers well be picking up these titles for the first time and that they deserve to enjoy the same characters as I have over the years. From that point of view it makes sense to bring dead heroes and villains back for another run. That said, it would be nice if the creators responsible for the retcon in question could find a way of writing it without making a clumsy mess that leaves no-one happy. Great post Mark. And kudos to Dan Slott for not brushing Harry’s sudden comeback under the table! Love this one Mark. I have to say seeing harry alive at the end of One More day was a breath of fresh air for me honestly. I know this is a little controversial but that event was the right move..maybe not the best path of execution but the right end game was in mind!! With the god awful version of The Goblin that we are about to see in the new ASM2 movie Ill take all the comic book Goblin I can get Reconned or not!